Found at a local flea market~ this lovely “madmen” style Samsonite suitcase. I should have walked away, instead I lingered. It stood on the grass, bumped up beside a stack of empty gilded frames and a chippy press back chair. The vendor smiled and nodded. The lining of the case was in excellent condition; someone had second thoughts, ideas of salvage, and replaced the original satin liner. My gaze drifted to the outer shell of the case, unmarked, just tired and worn. A tea stained shade of off white. I eyed the tag that hung from the handle. It read, stamped in ink, eight dollars. The price was right. How to fashion it yet preserve the story? What pulls me in? Do I wish to wander? Whose delicate fingers gripped the handle? I imagine a lady owned the suitcase. A secretary. Now, we’d say, Administrative Assistant. Was it packed with just enough for a racy weekend rendezvous? Or was the handle gripped tightly by the fingers of a daughter estranged from family? There was an urgency or a wish for convenience; the owner flew. Once home, I place the suitcase on a wooden table. From the cupboard I lift a familiar can half filled with annie sloan chalk paint (Pure White). The rich and creamy chalk paint covers the case in two coats. Warmth from the summer sun hastens the dry. 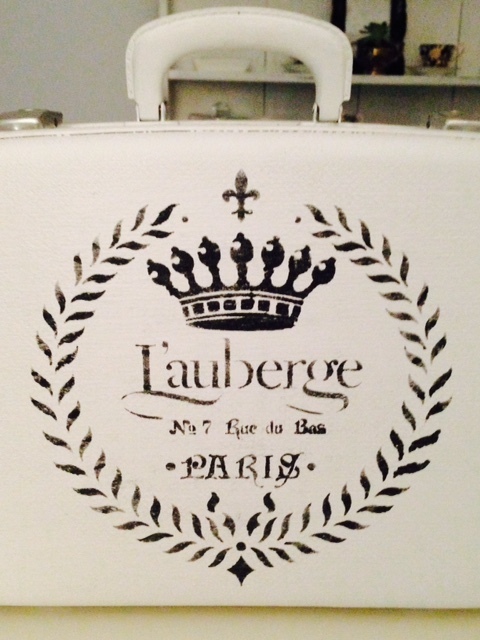 I dabble grey paint overtop a royal stencil motif, only to discover the motif is upside down when the case stands right side up. It’s one of those days when simple becomes complex. Two more coats of chalk paint cover the “mistake.” Light wax, rubbed and polished into the surface of the case forms a protective cover. The coveted stories, safe. Where to put this little gem and what to tuck inside? 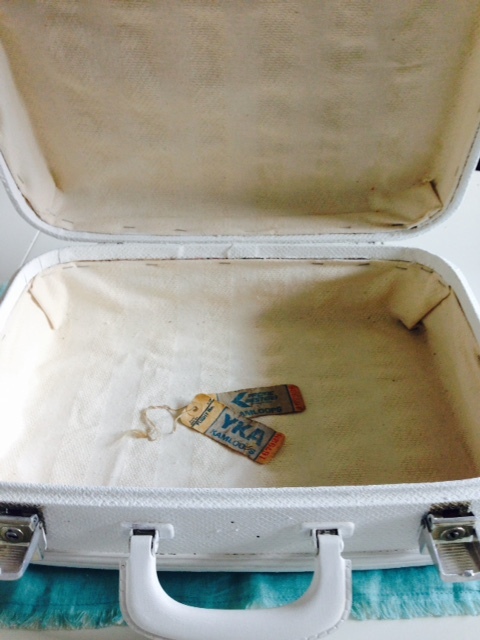 There are two luggage tickets secreted inside the case, left by an unknown hand. The worn tags read, PACIFIC WESTERN,” YKA, KAMLOOPS, BC. Oh- we must go “junking” together. It’s a great way to spend a morning. Thank you for your kind words. What to place inside the case? $8.00? Nuts! It’s a beauty. Nicely done. Great idea, a creative filling for a creative case!